Now Pay For Your Uber With Cash In 4 More Cities! Choice is a beautiful thing and soon many of you will be able to pay for Uber rides using cash. That’s right – you get all the Uber awesomeness and even more options when it comes to paying for your ride. Simply choose the CASH option, take a ride and pay your driver directly in cash at the end of the trip. After an extremely successful experiment in Hyderabad, we are expanding this test to Ahmedabad, Chandigarh, Jaipur and Kochi. We have worked hard to create a cash payment option that is seamless and truly Uber. The insight we gain from your usage and feedback is what will make this a successful experiment. So take rides and reach out to us at support@uber.com or on Facebook/Twitter. If you do not see the cash option then worry not. We will roll the cash option out slowly over the next one week. Not all of you will see cash right away as we are testing different cohorts and user preferences. 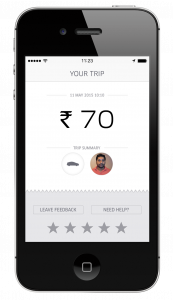 Uber has enjoyed tremendous support in Hyderabad and we are excited to experiment with cash payments on the Uber platform. With products such as uberGO and uberX, riders in Ahmedabad, Chandigarh, Jaipur, Hyderabad and Kochi have access to a variety of reliable, convenient and safe transportation alternatives. Cash further expands that universe. Before you get out, pay the amount shown to you & your driver – No haggling required! TO GET A FREE FIRST RIDE!